Ultrasonic Tomography is gaining importance in nondestructive evaluation due to rapid scanning in comparison to C-scan. However, ultrasonic tomography poses challenges due to ray bending. Ultrasonic beam path, obtained using Fermat principle has been incorporated in Algebraic Reconstruction Technique (ART) for tomographic imaging to take into account the effect of ray bending. In present work, an automated ultrasonic experimental set-up has been developed to record time of flight data in through transmission mode. The Time-of-flight data has been obtained for perspex samples containing artificially implanted defects of different shapes, namely, circular and elliptical. Reconstruction for both experimental and simulated data is presented with and without ray bending consideration. A significant quantitative and qualitative improvement was observed when ray bending was taken into account. Fairly good reconstruction was obtained for circular and elliptical defect in respect of size, shape and location. The study is also carried out for a symmetrically placed defect and a defect with eccentricity. Internal structure of an object using ultrasonic waves can be obtained by many methods. C-scan in pulse-echo arrangement is commonly used where same transducer is used for both transmission and reception. However, such an approach is difficult to use in situations where a measurement of the change in velocity across a plane through a three-dimensional object is required. Under such conditions, tomographic reconstruction is more suitable. Authors  have proposed the use of tomographic method as a means of image formation in comparison to C-scan. In acoustic tomography, one can use Rayliegh, Lamb, shear or longitudinal waves depending upon the application. But to reconstruct internal details of thick materials, only longitudinal and shear wave can be used. In the present investigation, longitudinal wave has been used. In this case, the most convenient acoustical parameter is the transit time from source to receiver. 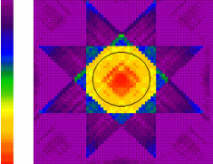 The reconstructed image is a distribution of acoustic slowness (the inverse of velocity) over an object cross section. 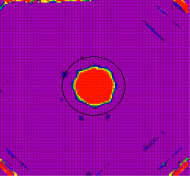 However, due to ray bending, ultrasonic tomography poses challenges. Kak  presented a detailed review on major development in imaging with Computed Tomography (CT). Censor  documented an article in the field of series expansion reconstruction method. CT has revolutionized X-ray imaging for medical purpose because it offers rapid, multiple plane views of area of interest. However, due to significant differences between X-ray propagation and acoustic propagation, (curved paths followed by acoustic wave in nonhomogeneous media) errors are introduced in the reconstruction. To take into account the effect of ray bending in ultrasonic, Anderson and Kak  have presented a review of digital ray tracing using Fermat principle in a two dimensional refractive index field. Denis et al  have shown that the reconstruction quality can be improved significantly for soft tissue using curved ray method. Industrial application of ultrasonic tomography is relatively sparse, with some success observed in defect imaging in variety of media including wood , SiO2 ingots for semiconductor applications  and geological media . The objective of present work is to apply such techniques for NDE of polymers. In this work, the use of ultrasonic CT to characterize polymer properties is explored. Digital ray tracing has been used to incorporate the effect of curved ray path in ultrasonic CT. This has been applied on simulated and experimental data. The performance of the tomographic reconstruction algorithms, ART (Algebraic Reconstruction Technique) and MART (multiplicative-ART) have been evaluated by Subbarao et al , in the context of interferometric tomography. MART was found to be superior to ART. Hence in this study, MART has been used .The difference between ART and MART algorithms lies in the manner in which the corrections are applied to the current field values. Corrections are additive in former and multiplicative in later. 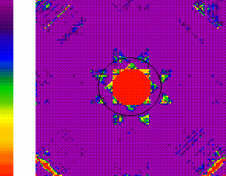 An automated scanning system has been developed in-house for characterization of damages. The system consists of high-resolution type ultrasonic flaw detector, UFD (USIP-12, Krautkramer-Branson make) interfaced with a PC through a high speed A/D converter card. The specimen is placed on the turntable. 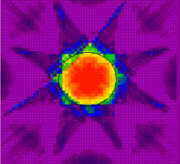 To obtain the tomographic image, it is required to excite and collect ultrasonic wave at different angles. The transducer used were MATEC M-525R immersion transducers of 5mm diameter, operating at nominal central frequency 5MHz. The TOF data were collected in parallel beam geometry for different angles of projection. Two specimens were made of perspex of size 60mm x 60mm having a circular hole of 20mm and an eccentric elliptical hole. The holes were filled with polystyrene. Longitudinal velocity was found to be 2700m/s and 2400m/s respectively in perspex and polystyrene. To achieve normal incidence for 450 angle of projections, a square block of 90 mm x 90 mm and 12.5 mm thick with a square hole of 60 mm x 60 mm oriented at 450 was made and the square specimen was encapsulated in it. Necessary corrections were applied for water and outer block material. The digital ray tracing employing Fermat principle is made use of in determining the exact weight matrix Wij as required in MART algorithm. To accomplish the reconstruction, following steps are involved. Step 1: Find TOF data numerically using the weight matrix, which is obtained by performing ray tracing on simulated image. Step 2: For initial guess to next iteration, obtain tomographic image using MART by considering weight matrix obtained by straight ray approach. Step 3: Perform ray tracing on the image obtained from pervious iteration and find weight matrix thereof. Step 4: Obtain tomgraphic image using weight matrix as found in step 3. The previously stated procedure has been applied to reconstruct the flaws of circular and elliptical shapes. Both simulated and experimentally obtained projection data have been used and the reasons for deviation of reconstructed flaw from actual size and shape have been discussed. The longitudinal velocity of the flaw material is taken as 88% of the base material i.e. perspex, in all cases. The four angles of projection viz. 00,450,900 and 1350 are taken which are found to be best combination with regards to reconstruction accuracy. In case of simulated study, the time of flight (TOF) is numerically calculated on the basis of actual path of the wave propagation using digital ray tracing for each ray of all projection angles. First, the reconstruction is carried out by considering weight matrix Wij, obtained from straight-line assumption and the same is shown in Fig. 1(a). The size of the reconstructed flaw is more than actual one, which is represented by black circle. The average error EL1 and RMS EL2 error are also high i.e. 0.61 ´10-3 and 18.52% respectively. It is due to bending of rays near the edge of flaw and the same phenomenon is not accounted in straight-line assumption. This incompatibility between the straight-line ray path and actual ray path based TOF becomes the source of noise in TOF data and hence, gives rise to higher errors. When the reconstruction is performed with curved ray-path based weight matrix Wij, then the average error EL1 drops by 0.1 ´10-3and RMS error drops by ~6%. This is reflected in realization of reconstructed flaw size and slowness value inside flaw is close to actual one (Fig.1(b)). The artifacts are also reduced when ray tracing is considered. Fig 2 (a) and (b) depicts the reconstructed images for the experimental TOF data. It can be seen that the reconstructed flaw is smaller than actual one. It is observed in TOF data that there is some zone in the receiving side in which no ray arrives through the flaw because of ray bending and this zone is around the flaw edge. However, a ray going around the insert may reach receiving end . This causes spurious projection data in the neighborhood of the flaw edge, hence the noise in projection, which is responsible for smaller reconstructed flaw size. The improvement in the reconstructed image with ray-tracing in terms of artifacts is evident from the figure. The flaw of elliptical shape located with some eccentricity is also investigated with experimental TOF. In contrast to circular flaw, the size realization is better in elliptical flaw. It can be attributed to the fact that the flaw boundary is less oblique to incident wave whereas in case of circular flaw, it is highly oblique to the incident wave near edge for all the angles of projection. This results into less bending near edges in elliptic flaw. Also, the reconstruction with eccentricity is possible (Fig.3). The tomographic reconstruction of the flaw of circular and elliptical shape is carried out. Improvement in the reconstruction quality, both quantitatively and qualitatively, is realized by incorporating digital ray tracing in the topographic procedure As different shape of flaws interact differently with incident wave, the size and shape of the reconstruct flaw image is influenced. It is found that the elliptical shapes are reconstructed better than circular due to high obliquity near edge. Both symmetrically and eccentrically located flaws are reconstructed with good accuracy. .Jansen D.P.,.Hutchins D.A and Young R.P., "Lamb wave tomography of advanced composite Laminates containing Damage"Ultrasonic 1994 vol. 32 No 2 pp 83-89. 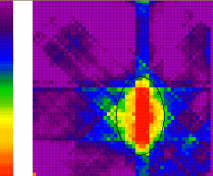 Kak A.C., " computerized tomography with X-ray Emission and Ultrasonic Sources" Proceedings of IEEE 67 (9) 1979, 1245-75. Censor Y, " Finite Series- Expeansion Reconstruction Methods" Proceedings of IEEE, Vol.71 1983 pp 409-419. Anderson A.H.,and Kak A.C., "Digital ray tracing in two-dimensional refractive index fields" Jr. of Accoustical Society of America , 72(5) 1982, pp 1593-1606. Denis F. Basset O. and Gimenez G., Ultrasonic transmission tomography in refractive media:Reduction of refraction artifacts by curved ray techniques, IEEE Trans. On Medical imaging, 14(1) 1995, 173-88. Tomikawa Y. " Non destructive Inspection of wooden Poles using Ultrasonic Tomogrphy" IEEE Trans. UFFC, Vol.33 1986 pp 354-358. .Subbarao P.M.V.,. Munshi P.and Murlidhar K., "Performance evaluation of tomographic algorithms applied to reconstruction of a three dimensional temperature field," Numerical heat transfer part B 31, 1997.